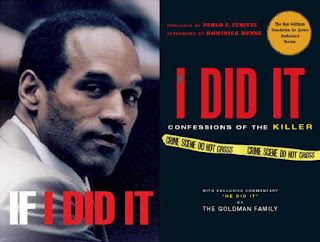 Because I Told You So: Book Report: "If I Did It: Confessions of the Killer"
Book Report: "If I Did It: Confessions of the Killer"
This is a disgusting yet mesmerizing look into a likely insane narcissist who has somehow convinced himself of his innocence of one of the most notorious crimes of the 20th century, while at the same time feeling guilt-ridden or braggadocious enough of committing the murders and getting away with them that he decided to write a book about how he did it. As untrustworthy as O.J. 's perspective is, his scattershot narrative manages to fill in several gaps in the mystery -- plenty of which aren't even covered in the 8-hour, Oscar-winning ESPN documentary. It's also fascinating to listen to O.J. rationalize the way he threw away his success and stardom. Every villain is the hero of his own story, and the way he saw it, he was an innocent man always trying to do his best in the face of impossible circumstances. It's intriguing to read between the lines to get the idea of what really happened in situations he shrugs off and explains away, such as the times in which police investigated him for domestic abuse. The introduction is equally fascinating, about the way the Goldman family got legal custody of the manuscript, and why they chose to publish it. An addition from the ghostwriter is also insightful into O.J. 's character and demeanor. Equal parts trash and valuable historical document, it's a book well worth a look for those who are interested in the case.